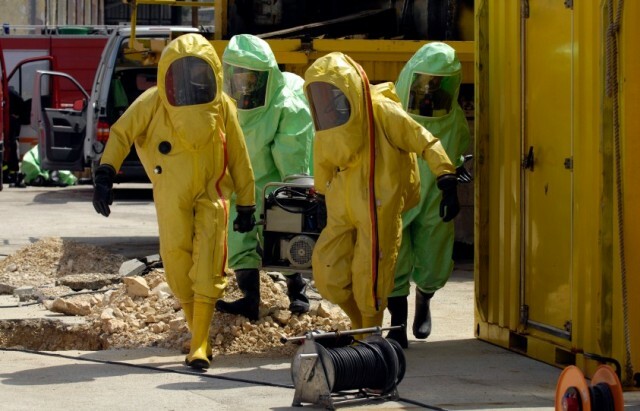 Our OSHA 24 Hour Hazardous Materials Technician Training (Classroom Version) course provides training to workers involved in HAZMAT Teams, such as Spill Response Teams or Emergency Response Teams, which may include firefighters, military personnel, private industry emergency responders, government employees, and others. This course helps HAZMAT Techs meet the training requirements in 29 CFR 1910.120(q), and also complies with the training requirements for First Responders Operations under State OSHA, and NFPA 472. This course is provided in a classroom setting at our facilities and is typically scheduled during a 3 day period for 8 hours per day. We can also provide this training on-site at your location when hosted by your employer. Request a quote for onsite training. Our OSHA 24 Hour Hazardous Materials Technician Training (Classroom Version) course is designed for firefighters, private industry emergency responders, military personnel, and government employees who participate or plan to participate in Hazmat Teams, such as Spill Response Teams or Emergency Response Teams. Hazardous Materials Technicians (HazMat Techs) are required to be trained in accordance with 29 CFR 1910.120(q), and also must have annual refresher training of sufficient content and duration to maintain responder competencies. Emergency response program to hazardous substance releases. This paragraph covers employers whose employees are engaged in emergency response no matter where it occurs except that it does not cover employees engaged in operations specified in paragraphs (a)(1)(i) through (a)(1)(iv) of this section. Those emergency response organizations who have developed and implemented programs equivalent to this paragraph for handling releases of hazardous substances pursuant to section 303 of the Superfund Amendments and Reauthorization Act of 1986 (Emergency Planning and Community Right-to-Know Act of 1986, 42 U.S.C. 11003) shall be deemed to have met the requirements of this paragraph. This course also complies with the training requirements for First Responders Operations under State OSHA, and NFPA 472. For more information on OSHA HAZMAT Tech training requirements or the HAZMAT Tech courses we offer, visit our HAZMAT Technician Training page. This Hazardous Materials Technician training course includes up-to-date, high quality training created with your safety and learning as our top priority. Currently, we only offer this course through a classroom training format. You can enroll in the classroom courses offered at our facilities through open enrollment. This course is typically scheduled during a 3 day period for 8 hours per day. The training will take a minimum of 24 hours to complete. View classroom training schedule. We can also provide the HAZMAT Tech training on-site at your location when hosted by your employer. Request a quote for onsite training. Once the course is completed successfully, you will be issued a Fed-OSHA certificate in accordance with 29 CFR 1910.120(q). You will be given access to download, save or print your HAZMAT Technician Certificate of Course Completion which is provided in PDF format.